Tractor solutions for road maintenance, snow removal, mowing and more. At AGCO®, we sell some of the most renowned tractor brands in the world. We also believe that buying equipment for government and non-profit applications should be simple. That's why we give you the flexibility to choose from our full line of Massey Ferguson® compact, utility and high-horsepower tractors and attachments, as well as Challenger® midrange, high-horsepower, 4WD articulated and track tractors. Whether it's road maintenance, snow removal, field and trail preparation, mowing or anything else, our wide range of powerful, versatile and durable machines can handle virtually any specification requirement. Plus, we'll always work closely with you to find exactly the right tractor or fleet of tractors that fits your organization's unique application needs and budget. Full portfolio of tractors and implements - we offer a broad portfolio of tractors, from nimble sub-compacts to rugged high-horsepower models, from 22-600 engine horsepower, and the implements you'll need to handle any job. Long time in the industry - For more than 100 years, we've been methodically perfecting our tractors for the diverse environments and weather conditions in which they work. It all started with Harry Ferguson, the engineer and inventor credited with the development of the modern agricultural tractor, that led to our Massey Ferguson 300 Series tractors having a predominant role in revolutionizing roadside mowing in the 1980s. And, even though more than four million of our tractors have shown up for work on farms and jobs like yours around the world, we never stop looking for new ways to improve them. Dealer network and support - Our equipment is sold through a network of independent dealers who are an integral part of the communities they serve. They are available when you need them to provide parts and service. For more than 100 years, Massey Ferguson has upheld a commitment to durability, reliability and toughness. Today, we're reinventing what compact, utility and mid-range tractors can be and redefining what they can do. 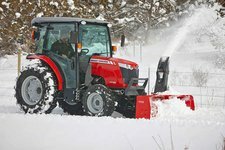 Whether it's road maintenance, snow removal, field and trail preparation, mowing or anything else, there is a Massey Ferguson tractor that will be ideal for the job. Meet the Challenger tractors. They're armed with all the power and innovative engineering you need. From the first mobile track tractors to the first and still most productive CVT, Challenger has always been dedicated to pushing limits. So you can power right through every job on your to-do list. To utilize the AGCO Massey Ferguson contract, you must be a registered OMNIA Partners participant. To order once registered, send an email to uscommunities@agcocorp.com or call 1-800-972-2426. Your request will be forwarded to AGCO's National Account Team for follow-up within 48 hours. To view pricing, log-in to your account using your password. If you don't have a password, please click on request contact and an AGCO Corp representative will contact you. Our tractors are sold through Authorized Massey Ferguson Dealers. To find a dealer near you, visit http://www.agcocorp.com/find-a-dealer.html and contact the dealer directly. Our dealers have a great level of knowledge in regards to our equipment and can provide assistance with specifications and configuration assistance. Many of our dealers have equipment in stock and can make arrangements for you to view. Working through our dealers help ensure the proper equipment for your application and ensure you have the proper ordering, pricing and shipping information. If you are unable to determine how to place an order through one of our dealers, please contact us at uscommunities@agcocorp.com or call toll free 1-800-972-9426 for prompt assistance. How do I place an order for a Massey Ferguson tractor? You must be a registered OMNIA Partners participant to utilize the AGCO Massey Ferguson contract. If you are not, please register now. There is no cost for membership, no user fees or commitments. OMNIA Partners is open to states, state agencies, counties, cities, schools, colleges and universities, non-profit organizations and special districts. Our tractors are sold through authorized Massey Ferguson dealers. To find a dealer or distributor near you, visit http://www.agcocorp.com/find-a-dealer.html and contact the dealer directly. Our dealers have a great level of knowledge in regards to our equipment and can provide assistance with specifications and configuration assistance. Many of our dealers have equipment in stock and can make arrangements for you to view. Working through our dealers help ensure the proper equipment for your application and ensure you have the proper ordering, pricing and shipping information. To find a dealer or distributor near you, visit http://www.agcocorp.com/find-a-dealer.html and contact the dealer directly. What products are in the US communities contract? Massey Ferguson and Challenger Tractors, along with a wide range if implements. Why should I buy from AGCO? Massey Ferguson has a long history with over 100 years in machinery production. In that time we have introduced many innovations that are industry leaders today with over 600 dealers within the United States to service your every need. In addition, we have 200 corporate field staff to support our dealers and you. Who do I issue the Purchase order to? All purchase orders should be submitted to the local authorized Massey Ferguson dealer of your choice. To view pricing, log-in to your account using your password. If you don't have a password, please click on request contact and an AGCO Corp representative will contact you. 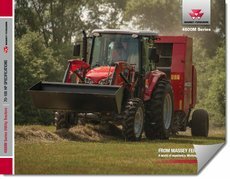 You can also contact your local Massey Ferguson dealer, visiting http://www.agcocorp.com/find-a-dealer.html directly and they will be happy to help you determine pricing, equipment options and spec information. Working with your local dealer will ensure you have the proper ordering and pricing information. If you are unable to determine how to place an order through one of our dealers, please contact us at uscommunities@agcocorp.com or call toll free 1-800-972-9426 for prompt assistance. Are there any other discounts in addition to the pricing available? We have provided US Communities a discount from list price in order to calculate the selling price. Freight, prep and delivery is not included. Shipping freight, prep and delivery will be determined by dealer/customer location, type and size of equipment. These charges will be in addition to the calculated selling price from list. Who do I contact for: inquiries and literature requests, contract information, place orders service calls and general program information, unresolved dealer service issues? 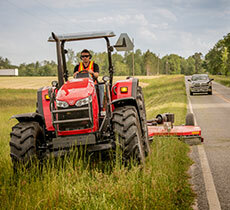 Massey Ferguson tractors help make your facilities more beautiful, environmentally friendly and a safer place to work. Prevent slip-and-fall injuries. Our GC1700 and 4700 series tractors keep the sidewalks and parking lot areas clear and unobstructed. First impressions are everything. A properly mowed lawn can act as a promise of what's to come for people visiting or working at your facility. Our 2300 series mowers are available attachments on GC1700 tractors. Keeping grassy areas cut will create an environment that's less conducive to breeding insects or rodents. Walkways and parking lots should be safe and free from ice. The MF1700 tractor equipped with a spreader will apply salt in the winter and fertilize your green spaces in the fall and spring. Reduce potential injuries from falls by keeping dirt and stone pathways level with the MF1550 box blade attached to a 2700 series tractor. Massey Ferguson takes the lead in promoting safety. All Massey Ferguson tractors are engineered to ASABE standards. ROPS rollover protection and high-intensity lights, color-coded levers, ground level fuel fill and seat belts - all are standard to help keep operators safe. Click here to see your local Massey Ferguson dealer for product demonstrations, training for operators, educational resources, and support for safety programs and events. Click here to visit your local Massey Ferguson dealer for product demonstrations, operator training, educational resources, along with support for safety programs and events.